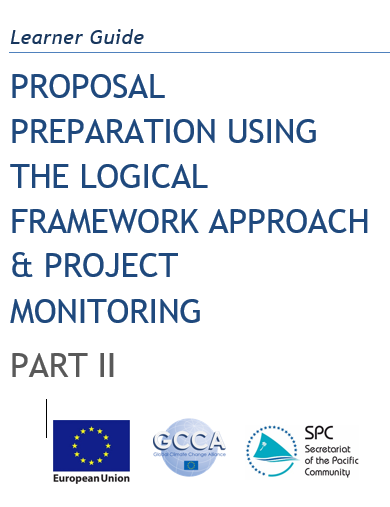 The 'Logical Framework Approach to inform Proposal Preparation' project was implemented by the Pacific Community (SPC) in collaboration with the Secretariat of the Pacific Regional Environment Programme (SPREP). Background information can be found here. The project was funded by the European Union (EU). 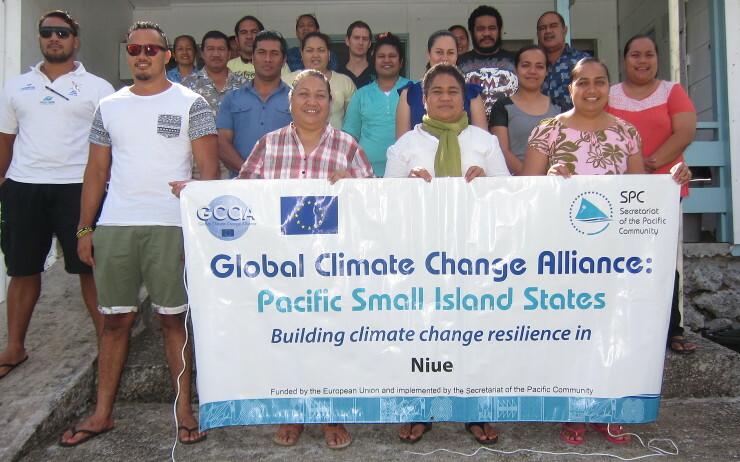 Pacific Research and Evaluation Associates (PREA) were contracted to develop training resources and deliver the workshops. The situation analysis step was added to explicitly require participants to think about what they already know about the selected sector/topic, what the existing sources of information are and what gaps might exist that need filling. Feedback from the first round of training found that participants still had trouble breaking activities from the logframe down into smaller tasks to inform the timeline. The training resources now provide much greater detail in the steps to follow the break activities down into smaller tasks and how to estimate how long tasks will take to complete. The collection of baseline data and ongoing monitoring data to assess project progress and impacts was acknowledged as an area where participating countries could needed assistance. 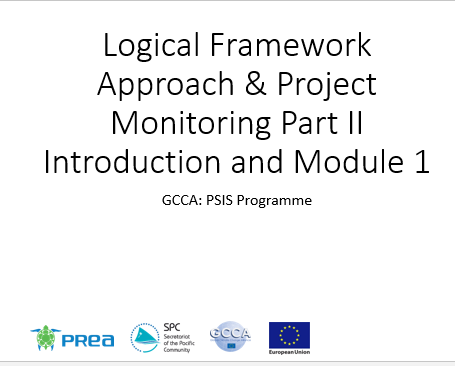 The revised training program and resources address this through dedicated content on developing monitoring plans, monitoring tools and reporting actual results against set targets. The use of free open source mobile phone survey software FieldTask (and supporting SMAP server) was also demonstrated. Participants were provided with a learner guide, copies of slides, and electronic resources on a USB drive. The most recent Training and Learning resources can be found below. 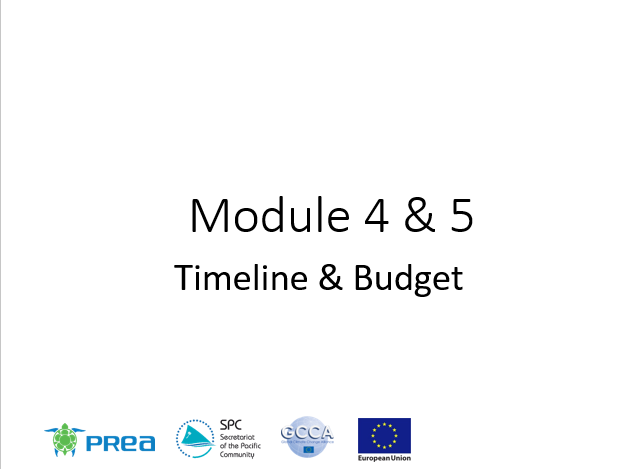 The training and learning resources that formed the LFA training project are provided below to assist future training and capacity building efforts in project design and proposal preparation. An impact evaluation of the training workshops was conducted between three to six months after each training using an online questionnaire and some phone calls. Fifty five workshop participants responded to the impact evaluation survey. The timing of the survey meant that 20 participants who attended the Cook Islands workshop were not included in the evaluation. Overall the LFA training appears to have been successful in building the skills and knowledge of participants to enhance their confidence in the use of the LFA, and supporting participants to submit logical and well structured project proposals. It is not possible to attribute the development of the funding proposals or their success in obtaining funding with the LFA training. However, when considering participant feedback, it is clear that the training has built the capacity of participants to design better projects and write better proposals. 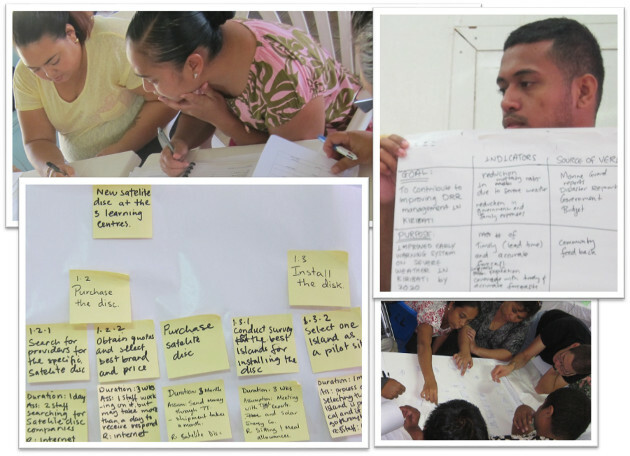 The piloting of post-workshop one-on-one mentoring in the Cook Islands was effective and valued by participants who were able to continue working on their project ideas and in some cases complete a project proposal. Number of participants trained: 125 across 6 countries. Number of proposals submitted: 40. Thirty seven proposals submitted used the LFA. Twenty were successfully funded and seventeen are still awaiting confirmation. Overall, the level of confidence in undertaking the main steps of the LFA increased. Participants expressed more confidence in performing the situation analysis, stakeholder analysis, and problem and solution analysis. More participants indicated they could perform other steps (logframe and developing an M&E plan) with the assistance of others. The timeline and budget steps remain those which participants are less confident with. 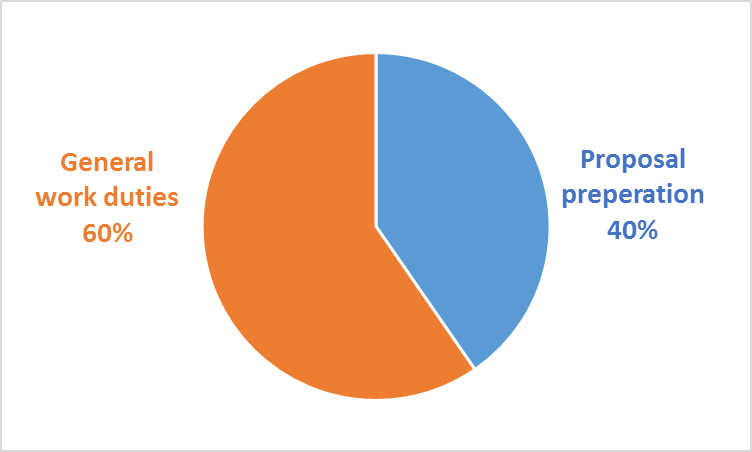 Overall, respondents reported that the LFA steps had been used more often in performing their general work duties (used 223 times) compared to developing a project proposal (used 151 times). This demonstrates that the LFA training has built capacity of staff not only in proposal preparation but also in the performance of their role in government, or other sectors. This emphasises the benefits of the LFA process in planning for both work (e.g. strategic planning) and proposal preparation. As such the investment in the training programme has brought wider benefits than intended. Integrate the LFA into country-level project design documentation to promote its application. Designate a local or regional LFA focal point as a mentor to provide support to participants to apply the LFA. Provide more one-one-one mentoring to support the development of project proposals after the standard 4-day workshop is conducted. Design and deliver separate training workshops on monitoring and evaluation (2-3 days) and budgeting (2-3 days). Investigate opportunities to develop an accredited course or subjects for project design (LFA) and monitoring and evaluation that covers off on different topics in detail over longer time periods. Design and deliver a training programme in the use of smartphone survey technology (e.g. 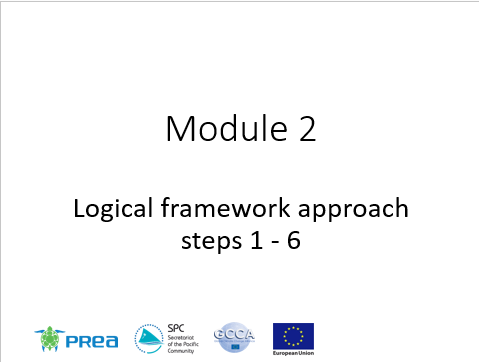 FieldTask) to selected participants using a ‘train the trainer’ model. Develop internal capacity within SPC or other CROP agency in the use of smartphone survey technology (e.g. FieldTask and SMAP) to support member countries in the use of this technology. 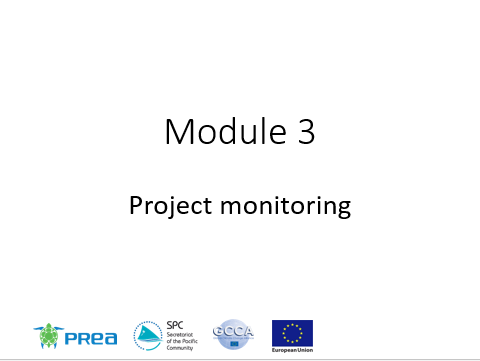 For more information about the SPC LFA training project, contact the SPC Geoscience Division.